Source: Centre for MB Studies, Winnipeg, MB (NP052-02-052). In the early years there was much cooperation between the various Mennonite groups and joint services were often held at the Adair Ranch. Eventually the Mennonite Brethren and General Conference Mennonite families divided the assets and built their own churches. The Mennonite Brethren formed the La Glace Mennonite Brethren Church. The Hoffnungsfeld Mennonite Church at Grande Prairie (Hoffnungsfelder Mennoniten Gemeinde zu Grande Prairie) was organized on 30 July 1927. The church was composed of local congregations that met in Wembley, Beaverlodge, and Lymburn. Elder Franz Enns of Whitewater, Manitoba, officiated at the organizational meeting. Jakob Thiessen from the Beaverlodge group was appointed to serve as leading minister, and Gerhard A. Neufeld from Wembley and Jacob D. Nickel from Lymburn also served as ministers. Neufeld and Nickel were ordained by Elder Cornelius D. Harder on 30 June 1929. On 27 June 1931, J. D. Nickel became the elder of the church, and was ordained on 21 February 1932. At this time the three congregations had a total membership of 115. The church building in Wembley was constructed in the winter of 1928-29 and made of logs from the nearby bush. In Beaverlodge a similar church was constructed on the farmstead of Jakob Thiessen. 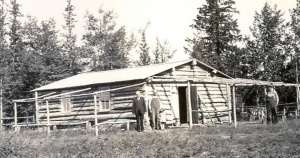 A small Bible school operated in Beaverlodge for a few years. After he sold his farm and moved to Armstrong, British Columbia, the group met in homes. In Lymburn families initially met in the home of A. P. Regier. Minister J. D. Nickel was assisted by J. J. Wiebe and D. Z. Wiebe. A log church was built in 1933 on the Henry Funk homestead, three and a half miles west of Lymburn, and dedicated in July 1934. 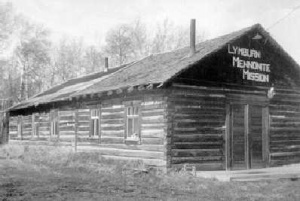 The group in Lymburn organized a Bible school with J. D. Nickel as instructor from January to March 1934. The school relocated to a log building on the Adair Ranch in Wembley in the fall of 1934, where Leonard Adrian was the instructor. This Bible school operated from the fall of 1934, when it had 11 students, until the spring of 1937. Those who wished to attend Bible school after the school closed attended the Bible school in Didsbury. In the 1940s, many families moved away from the Wembley area, and by 1948 the congregation ceased to exist. Those who remained either joined the La Glace MB Church or other churches. In 1950 the Lymburn building was moved to a site one and a half miles west of Lymburn, where services were held until approximately 1970. The Mennonite Sojourn in the Peace River Area: A Companion to Our Reunion, June 15, 16, 17, 2001, David Friesen, gen. ed. 2001. Thiessen, Richard D. "Hoffnungsfeld Mennonite Church (Grande Prairie, Alberta, Canada)." Global Anabaptist Mennonite Encyclopedia Online. June 2013. Web. 21 Apr 2019. http://gameo.org/index.php?title=Hoffnungsfeld_Mennonite_Church_(Grande_Prairie,_Alberta,_Canada)&oldid=155918. Thiessen, Richard D. (June 2013). Hoffnungsfeld Mennonite Church (Grande Prairie, Alberta, Canada). Global Anabaptist Mennonite Encyclopedia Online. Retrieved 21 April 2019, from http://gameo.org/index.php?title=Hoffnungsfeld_Mennonite_Church_(Grande_Prairie,_Alberta,_Canada)&oldid=155918. This page was last modified on 4 December 2017, at 01:41.